That’s a real shame because Kyle Mooney (who also stars) and Kevin Costello’s screenplay, directed by Dave McCary, is one of the most charming little gems to come along in a while. Mooney and McCary, along with Beck Bennett and Nick Rutherford, came together in 2007 to form the sketch comedy group, Good Neighbor, and since 2013, Mooney has been a cast member of “Saturday Night Live” where McCary works as a segment director. That sounds like a lot of extraneous information, but if it isn’t clear to you as you watch just what a labor of friendship and ensemble work “Brigsby Bear” is, the filmmakers make it clear in the credits, where, in addition to a cast and crew who wore multiple hats, a slew of “Utah Volunteers” are thanked for their contributions. The premise of “Brigsby Bear” is, on its surface, a grim one. James was abducted as an infant, and has lived his 20-something years in an underground bunker with his abductor parents, Ted and April Mitchum (Mark Hamill and Jane Adams). Throughout his life, each week like clockwork, a new episode of a children’s show called “Brigsby Bear” arrives on video cassette. “Brigsby Bear” the film risks comparisons with Peter Weir’s 1998 “The Truman Show” but the films differ in important respects. Truman Burbank (Jim Carrey) has been abducted by a faceless corporation. James’s abductors, despite the heinousness of their crime, obviously dote on their ward. Whereas Truman is the unwitting star of 24-7 reality show for an audience of voyeurs, “Brigsby Bear” the show is initially an educational tool for James, ala Sesame Street, with episodes designed to teach math or spelling or geography or good manners. While “The Truman Show” is about a kind of soul-sucking corporate cynicism, not a single frame of “Brigsby Bear” betrays an air of world-weariness or disenchantment. One night, James puts on his gas mask – to protect from an atmosphere he has been taught is toxic – so he can sneak out and sit on top of the bunker entrance. As he gazes out at the imaginary creatures with which Ted has populated the bunker entrance, a fleet of police cars comes racing toward him lights flashing lights, sirens screaming -- sights and sounds he has never before seen nor heard. Suddenly, he is abducted back into the real world. Mooney plays James as an arrested, overly excitable ten-year-old, at times seemingly somewhere on the autism spectrum. A sensitive Detective Vogel (Greg Kinnear) tries to explain the circumstances to the bewildered James. When James is united with his birth parents, Greg and Louise Pope (Matt Walsh and Michaela Watkins), they try to create something like normalcy, but as well-meaning as those efforts are, they can sometimes seem downright cruel through James’s eyes. To complicate things further, Greg and Louise have a daughter (Ryan Simpkins) – a teenager resentful at losing standing as an only child and embarrassed by a weirdo who talks about nothing but an imaginary character while day after day donning a Brigsby T-shirt. Just as it begins to seem to Greg and Louise – as it does to us – that the attempt to integrate James – despite everyone’s best efforts and James’s intrinsic good nature – is not going to turn out well, we sense that James is taking in more than the adults are giving him credit for and something happens. First, Greg takes James to a movie, the first time he has ever seen anything projected on the big screen. Second, sister Aubrey grudgingly lets James tag along to a party she’s going to with a girlfriend. Their friend Spence (an endearing Jorge Lendeborg Jr.) is there and is the first person to genuinely and intuitively engage with James. After seeing the movie, James had asked his father, who is the person who makes movies? His father explains that many people make movies, not just one. For James the answer is revelatory. If lots of people make movies, he can make a movie, and when it turns out Spence is an amateur filmmaker of sorts, James sets out to continue the story of Brigsby Bear. “Brigsby Bear” is more than a self-reflexive movie, more than a movie about making a movie. It is more than paean to the magic of movies. It is a hymn to the transcendent power of creativity, especially that pure creative energy of childhood imagination. 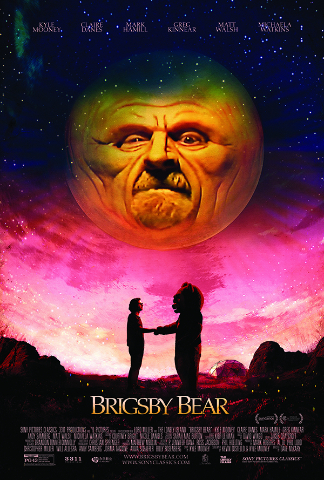 Brigsby Bear’s nemesis is a huge sun, a sun that looks like nothing so much as the pioneering filmmaker George Méliès’s iconic Man in the Moon in his 1902 “A Trip to the Moon” – we might call him the Man in the Sun, though in the Brigsby world he is Sun Snatcher. Brigsby, looking like a cross between a teddy bear and a 1960s astronaut, does not himself possess super powers – excepting his kindness, bravery and wisdom – but the objects he wields have special properties, and the saga of Brigsby and his world rivals the creations of a J. R. R. Tolkien or J. K. Rowling. This pitiable attempt at a synopsis falls completely flat in the face of a film that is an unbridled celebration of creation, collaboration, friendship, love and forgiveness. Quite simply, “Brigsby Bear” is the tale of an unworldly young man come to earth who offers the possibility of redemption to all who open their hearts to him. Yes, this little treasure didn’t make it to the multiplex, but if the DVD is released in time, put enough by to stuff every stocking on your holiday list. In theaters in limited release. No official release date yet for DVD and/or Blu-ray. Based on the average time between opening day and home entertainment releases, Movie Insider’s unofficial estimate is around December 2017. Posted by Nancy Kemf and My Own Private Cinema.